This was a beautiful little garden vow renewal, with a wonderful young couple from the US. They got married a week before, in a civil ceremony back home, and wanted to say their vows on their honeymoon to Tokyo. They asked us to help them celebrate with a small affair, with just one guest. So, with the bride’s cousin in tow, they embarked on a ten day tour of Japan, which culminated in their vows and a photo-shoot on their final day in this country. We were really happy that they opted for our favorite garden, Higo-Hosokawa. Although early Autumn, the leaves were starting to change, and in the hour and a half photoshoot, we explored every nook and cranny of the garden and really had a lot of fun. The garden vow renewal started with a trip to our favored Kimono Rental vendor, Vasara, in Shinjuku. The staff helped them select their kimonos, and the ladies had their hair done by the professionals at the shop. 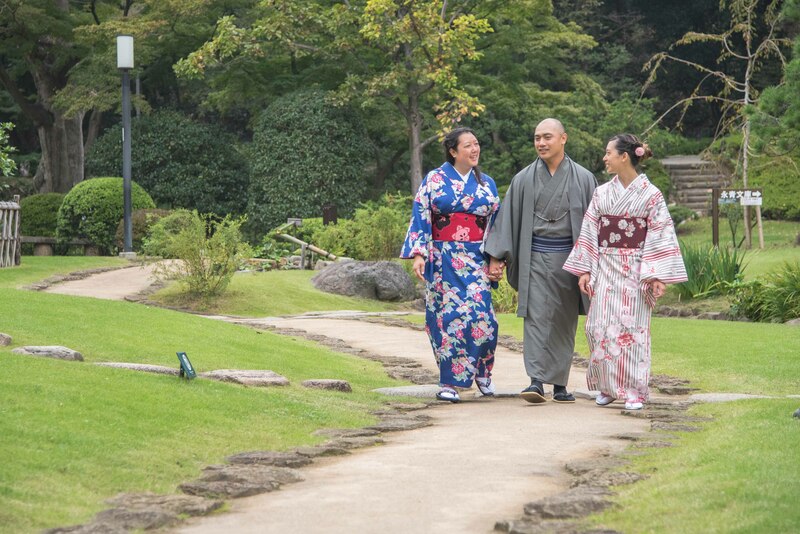 The choice of Kimonos can be a bit overwhelming, but it seems that there are a few generally accepted favorites: we have been using Vasara for a while now, and the blue kimono worn by the bride, has proven to be a crowd favourite! Trying to walk while wearing full traditional attire is both exciting and challenging. And for some, it takes some getting used to! Everyone says that the tight obi (kimono belt/sash) really helps improve posture, however the traditional shoes, geta, are quite awkward! Just with pretty much all our sessions recently, the weather threatened rain. Again, as with all our sessions recently, he rain held off, and we had free reign to explore the garden. We we not just blessed by the weather, but also by the presence of a lucky bird. The staff told us that it was a rare thing to have such a bird in the garden, and that its presence is always seen as good luck. Lucky for us, it hung around for the entire shoot. What a great omen for this couple! A huge thanks to the couple for allowing us to be part of their special day. We wish you both the very best of continued luck, as you embark on your journey as husband and wife! The leaves were starting to change! “Momoji” in Japanese. This beautiful bird (I have no idea what species) blesses us with its presence. In spite of getting a few close up shots, it we did not scare it away! 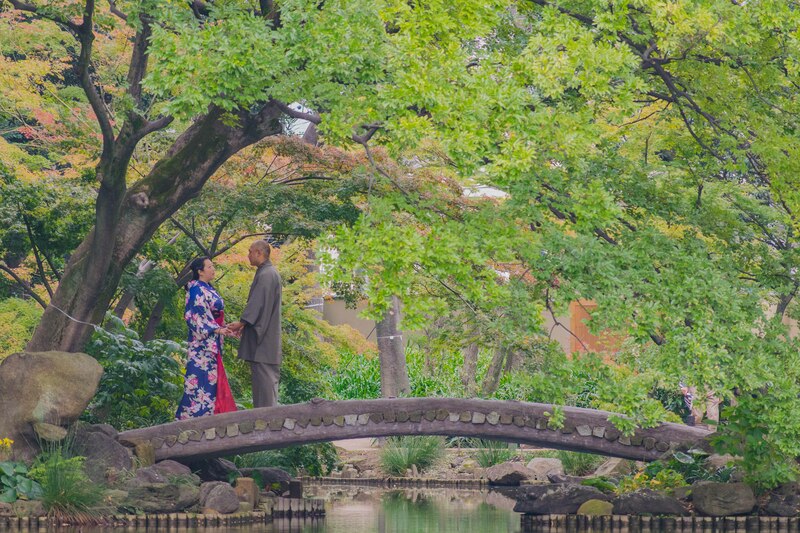 “My wife and I wanted to do something special and romantic during our trip to Japan and Ross and Ayako couldn’t have made it any easier! We reached out to Serendipity Flower & Wedding through email to inquire about a vow renewal and they responded right away. Over the next couple weeks we emailed back and forth about potential dates, garden choices, and vow options. Ross and Ayako were always quick to respond and offered to talk via Skype or WhatsApp if we needed it. Once we settled on our choices a meeting date and location was set. Ross met us and walked us through everything – the kimono rental, the ride to the garden, the vows, and the photo shoot afterwards. This would have been near impossible to do on our own since we don’t speak any Japanese. But Ross and Ayako took care of everything and made it so easy!